Julia Leu, the local mayor, said she was "absolutely gobsmacked". A photograph of a group of men inside a baited crocodile trap in northeast Australia has surfaced, making it the talk of the town. The bunch of men has been labeled as “idiots of the century” after their quirks came to light. 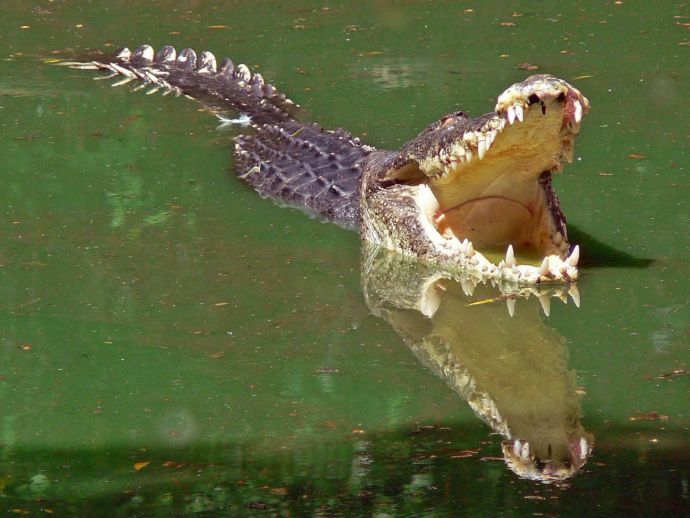 An investigation was launched immediately by The Department of Environment and Heritage Protection (EHP) into the "stupid and reckless interference" of the crocodile traps at Port Douglas marina of Queensland. Two weeks ago, a 4.3m crocodile had killed a 79-year-old lady Anne Cameron who suffered from dementia. The bait traps were laid in the same waters in which the crocodile is found. Only way t check a croc trap to ensure the live bait stays alive!! A department spokesperson told the ABC News, "These traps are specifically designed to attract crocodiles and they are deployed in places where a problem crocodile is known to be present." "It is extremely dangerous to interfere with a crocodile trap, regardless of whether or not there is a crocodile within. It is not an exaggeration to say that interfering with crocodile traps can be potentially life-threatening for the person concerned." The act of the “idiots” was slammed by a man on the social media. They could, apparently, face a fine of $15,000. "You've got grown men swimming in a crocodile trap, exactly where we put the bait for the crocodiles. The reason the trap is there is that we suspect there are crocodiles in the area. The trap is dangerous in and of itself, and of course, if the crocodile were to appear that would be even more dangerous," he added. He has requested the person who would have any possible information on the matter to contact the department.